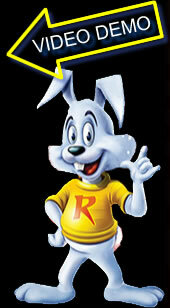 Razamatazz Magic present - Crazy Candy, a fantastic new magic trick for children's entertainers that is great fun, very easy to perform and designed with the same high standard as existing Razamtazz Magic effects. Another fun packed new magic trick from Razamatazz Magic featuring the magic 'JUMPING' lollipop! Great classic trick that once again has been given the Razamatazz sparkle but as always with a big twist at the end. A visually stunning picture of 3 sweets and a lolly is shown. The lolly starts at the bottom of the card and magically jumps up one place at a time every time the magician passes the card behind his back. The magician passes the card behind his back again but this time the sweets all disappear ! The children now think that all the magician has done, is turn the card around to make the sweets vanish but just when the audience think they know how they disappeared, they are in for a very surprising ending as the magician reveals Hammy Hamster on the back eating all the sweets !!! 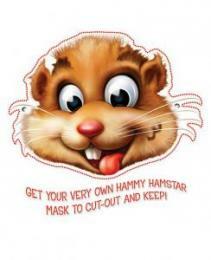 Included in this pack is your very own Hammy Hamster mask to Give out to the birthday child. birthday child as a special present during your show, or the magic assistants that help you perform the magic. Alternatively you can have them copied onto good quality card and use them as a way of increasing revenue for each show you do, simply tell the parent that you provide a high quality hamster mask for the birthday child. Extra masks can also be provided as party favours for the other children at a nominal extra charge. To promote yourself you can even have your details printed on the back. Also included is a sheet of printed sweets and lollies for extra bits off business, simply cut out the shapes and laminate them. One use for this is as follows. 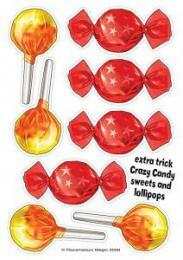 Cut out a lolly or sweet and laminate it, then on the back stick a magnet or piece of Velcro ‘hook’ material. Have this face down on your magic table or in your back trouser pocket. After the final part of the trick once you have turned around position yourself so you can discretely retrieve this gimmick. When you show Hammy Hamster on the prop and the children are distracted, discretely lift the gimmick and stick it to your back. If using a magnet, before the show simply attach a metal badge to the inside of your outfit where you want the lolly cut-out to stick, the lolly gimmick will stick to the badge. Then say to the children “I do not know how Hammy managed to eat all those sweets so quickly” As you turn around to put the effect away. The children will soon let you know where the sweet or lolly is. Another effect is to have the sweets and a lolly cut-out appear under chairs or from somewhere else in the room. Alternatively you could then go into your preferred sweet production routine. The only limitation is your imagination.